TableTalk Global has made great strides in 2018 and with 2019 on the horizon, we feel ready to take on the new year with new goals in mind. In taking a look back on the year 2018, we feel gratitude towards those who have believed in us and have taken the leap to start conversations on their campuses and in the world. In the last year, we have launched over 25 new chapters on both high school and college campuses, including Wichita Collegiate High School in Wichita, KS, as well as the University of California Santa Barbara. Working with students across the country brings us joy and we can’t wait to continue forming these relationships into the new year. Our partnerships have blossomed and we are lucky to have begun working with incredible organizations in the dialogue space, such as the National Conversation Project, More In Common, the Listen First Project, Living Room Conversations, Urban Confessional, AllSides, Civic Spirit, and the Connection Curator. We partnered with More in Common to create resources for navigating difficult conversations as the first chapter of a beautiful series. We participated in #ListenFirst Fridays to promote listening as a part of the NCP movement (National Conversation Project), and we joined forces with the Listen First Project at Duke University to create a joint campus chapter of TableTalk and Listen First. We are constantly inspired by the work of our partners and we look forward to supporting their visions for the new year. Lastly, in looking back on the year, we piloted our incipient TableTalk Global internship program in May 2018. We began with ten incredible student leaders and we added eight more to the TTeam for the Fall 2018 cohort. Working with our intern team has demonstrated to us how important it is to build momentum and come together. At TableTalk Global, interns are valued and are active participants to the program landscape. Thanks to our interns, we have designed a new mentorship program to create cohesiveness within our chapter community and we hosted our first official fundraiser as a part of Giving Tuesday — on top of all of this, our social media and graphic design presence has never been better. We thank our student leaders for donating their time to TableTalk Global and we can’t wait to welcome in our next class of interns in 2019 as there are so many exciting, new projects to be hatched. With each accomplishment 2018 brought us, we also experienced obstacles. No organization is perfect and we are still looking to grow, expand, and learn to better serve our community. As always, we welcome new ideas and feedback, and we hope to continue growing in ways we never previously imagined. Despite each challenge or bump in the road, we can always look to our local leaders. 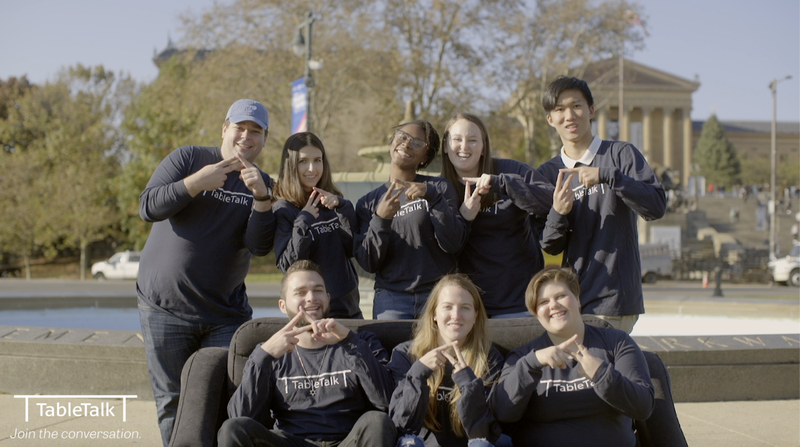 They are the heartbeat of the TableTalk family and are making an impact on each campus through their events, teamwork, and community building. In honor of wrapping up 2018, we wanted to compile a list of 18 takeaways that our TableTalk leaders have internalized in 2018. We hope these values will inspire you to embrace the essence of TableTalk and carry these ideas into the new year to be more present, thoughtful, and conversational with the people around you! Have a happy and healthy new year and we can’t wait to continue #SpreadingTheConversation with you in 2019! 1I never thought that virtual connections would teach me so much about others in addition to being part of a positive a work environment. After being a part of the global team that TableTalk brought me, I have reflected and realized the power of connection through all of TT’s leaders and all they have taught me through their empowerment to take on new projects and the eagerness to connect with people on a deeper level. 2This year, TableTalk allowed me the chance to cross paths and engage with people of so many differing viewpoints and perspectives. In particular, it introduced me to the incoming class at Penn, who I wouldn’t have had the chance to get to know otherwise. 3This year TableTalk taught me the importance of thinking outside the box. On a daily basis, we are faced with such orderly tasks that have clear and precise steps, we have become so prone to thinking like this. Through the conversations I have had with people in TableTalk, I have learned how important it is to stop thinking about things so literally and to take a more creative approach not just to the conversations I have in TableTalk but in life in general. 4This year, TableTalk helped me practice my leadership skills when I took on a new position and more responsibility. I learned more about leading a team, interacting with committee members, and organizing events with other clubs. I feel as though I gained a lot from the experience and developed skills that I will use in the future! 5TableTalk William and Mary spent most of this last year working with student leadership to become an official student organization. It was a lengthy process, and was often at times frustrating. But it allowed me to spend quality time thinking about the importance of structure for our new organization, and the significance in being patient throughout the process. 6It’s good to try new things. Exploring your horizons is important and even if you’re not sure how it will go or if it’s hard, just try your best! It’s good for you! 7Being a TableTalk intern helped me learn responsibility in ways such as time management, organizational skills, and teamwork. I got to research topics I’m passionate about and was able to collaborate with an incredible team. Through this internship, I’ve learned a lot about many avenues of work and grown as an individual in a multitude of ways. 8TableTalk has taught me how to responsibly respect everyone’s opinion. I’ve had moments where I wouldn’t agree on certain topics, but I was able to listen and understand while creating a great conversation. 9This year, TableTalk helped me understand the importance of building relationships. I have always been a talkative and outgoing person but had never been put into a situation where I had to build relationships with people I only worked with online. The entire TT internship experience has helped me become more comfortable in regards to turning strangers into friends. 10TableTalk has taught me that nothing is easy at the beginning, but with hard work and passion you can surprise yourself with what you achieve! 11Both TableTalk Emory and Global have taught me the power of support and what having a loving and supportive group can do for confidence, collaboration, and success. 12TableTalk has taught me to challenge the norms around me in my community. I have learned a lot about how my fellow students engage with each other through TableTalk events, and it has inspired me to think about how we can improve and keep breaking barriers in how we have conversations. 13Everyone has a story to tell and I’m just a visual storyteller. This year, TableTalk allowed me to use my own passion for photography and capture moments when people were driven by their own passions. 14 I never would have thought that a casual conversation would have had such an impact on me, but by putting down our phones and engaging in face-to-face conversation, I discovered something new about myself and others because of TableTalk. 15TableTalk taught me the power of human connection. 9 times out of 10 when you tell someone you are struggling, they will also open up about what they are struggling about. All I had to do was #StartTheConversation. It seems daunting to be vulnerable, but once I am, my connections become deeper and I realize that I am not alone. 16I envision something like TableTalk on my campus as a forum for people to voice their concerns, thoughts, observations- big and small- and to communicate rather than talking right past one another. When we engage in dialogue, we facilitate understanding, patience, and kindness, even though it can be a struggle. 17When you are challenged with a task that may seem daunting, it is always beneficial to put your best foot forward and keep on going. Working with TableTalk these past few years has had its challenges as well as its rewards, but being able to work through them and push myself to promote a message I believe in has been worth the struggle. I am so grateful for TableTalk and everything it has given me. 18Sometimes, all it takes is reaching over to the person next to you in a coffee shop, on the subway platform, or on an airplane to open yourself up to new perspectives and experiences. TableTalk taught me how simple, yet powerful a greeting can become and how relationships and connections can evolve simply from introducing oneself. We put so much pressure on this simple notion of saying hello and acknowledging a stranger, but if we just cross the threshold, we could change a culture for the better. If you have something you would like to share that TableTalk taught you this year, please send it to hello@TableTalkGlobal.org!